Plugin developers and theme creators have been busy this week again. Sadly, the themes that I have looked at really don’t cause any tingle in my fingers 🙁 However, I am excited about the new release of Optimize Press 2.0 but that hasn’t launched yet…. 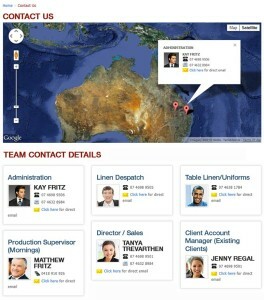 Contact us – Contact People is a nifty sort of contact form that produces a business card type overlay on a map. Great plugin for those doing offline work and ecommerce where you want to display members of team/employees profile. Contact Us Page – Contact People allows you to easily transform your themes dull and boring contact us page into a stunning and vibrant, ultra-professional Contact Us Page not only for your General sites contact us but for individual profiles (people, positions, Stores) within an organization. The first thing the plugin does is allow you to create an unlimited number of profiles. Profiles can be anything you want – People, Head Offices, branch Offices. Profile card are displayed in rows on the Contact Us Page under the Google map if you have activated the map. Full in plugin card style options means no coding required to style the profile cards. Create unlimited Contact Profile Cards. Display each person, department, store or branch office on a profile card on the Contact Us Page. Features direct email submission from users to each contact profile card. Contact Profile cards: Show as much or as little contact information as each profile desires / requires. Department Contact Profiles: Display each departments contact profile, e.g. support, sales, admin. Stores and branches local or worldwide – show on Google map. Contact Us Page display is fully mobile responsive. Set the number of profile Cards to show per row. Display up to 5 Cards per row. Click to email. Contact form with smooth email pop-up forms for easy and quick submission. Mobile device optimized, all tablets and phones. Apply all Widget content from the plugins admin panel. Enable/Disable google location map and map co-ordinate settings. 2 Content areas for adding information. Business / Organization address and contact fields. Add email contact from any plugin via shortcode. Full support for Right to Left RTL layout on mobile first admin dashboard. When you download Contact Us Page – Contact People, you join our the a3rev Software community. Regardless of if you are a WordPress beginner or experienced developer if you are interested in contributing to the future development of this plugin head over to the Contact Us Page – Contact People GitHub Repository to find out how you can contribute. Profiles Menu > Add New, Add some profiles. WordPress Appearance Menu > Widgets and add contact widget to sidebar. WordPress Appearance > Menus and add the Page Contact Us page to your menu. Enjoy your dynamite looking contact us page. A super easy way to add the awesome Metrize Icon Set. No need to type in shortcodes, just select the icon you need. Easy to use Icon selection popup. Shortcodes for every Metrize icon. WP Ultimate Recipe – There are a few recipe plugins in the repository already ,but this one really caught my eye. I like the way it has been laid out so that you add “ingredients” for instance and a cute little list is generated for you. Nice interface and display and just looking at it makes me wish I had a cupckae recipe blog! FP News Ticker allows you to display news/post from a specific category in a widget position with ticker(reveal – output will like type writing) effects or fadeIn/fadeOut effects. The sliding/scrolling options are managable from wordpress admin area. You can also assign the category and the post limit. You can control over your testimonial sliding/scrolling transition effect, time, direction etc. ** If the control buttons are not visible and the news title is not so long, then it will behave as Responsive view. Affiliate Assassin – this plugin claims to help you promote affiliate offers. There are a number of videos demonstrating the concept. Basically it works like this; find an article on a topic related to your niche and add that url to your Affiliate Assassin dashboard, then take the url of your affiliate website and add that to the dashboard. The plugin then posts the useful link in Facebook groups, twitter etc which redirects to the affiliate link. The theory is if you posted thea ffiliate link in most groups it would just get removed. This is a way of providing useful information and still getting paid for it. There are three licenses for it – single, multi and developer. The plugin is currently on special. Snap Mobile – plugin to create drag and drop mobile sites on your WordPress installation. It is on discount at the moment.